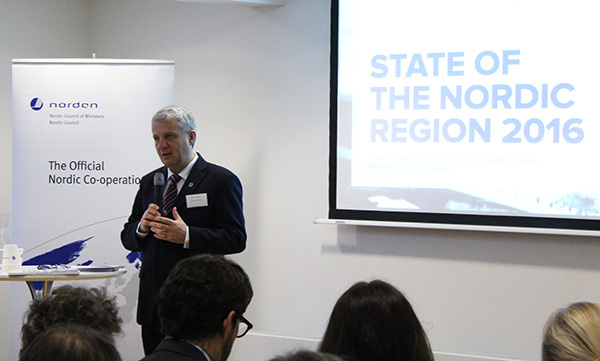 Nordregio’s State of the Nordic Region 2016 report was successfully launched on 16 February in Copenhagen at the Nordic Council of Ministers’ office. An exclusive breakfast event with Alasdair Ross from The Economist Intelligence Unit drew a room full of people. Dagfinn Høybråten, Secretary General Nordic Council of Ministers welcomed the audience to the launch. “Politics needs to be knowledge based”, Høybråten stated, adding that reports like State of the Nordic Region 2016 and the work that Nordreio does is key to better informed Nordic policy development and Nordic cooperation. Nordregio’s Director Kjell Nilsson and GIS expert and main author of the report Julien Grunfelder then presented the key findings of the report. What are the main trends affecting the Nordic countries? Some countries have recovered better from the financial crisis than other. What is the current situation and which regions have the greatest potential? 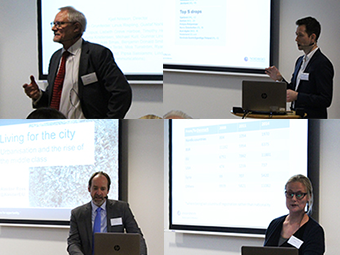 Grunfelder presented the new Regional Potential Index created for this report, ranking all the 74 Nordic regions with the highest and lowest future development potential, based on labour market situation, demographic structure and economics. Alasdair Ross, the Economist: “We are currently in the middle of the largest migration in the human history.” Ross is specialized in global phenomena and according to him the key trends now are urbanisation and the growing middle class. Half of the world’s population lives in cites. There is no stopping this progess but with policies it is possible to balance the development. All the GDP growth is taking place in 600 cities of the world. The world has also has become a middle class place. Especially in China the middle class is growing fastest. Fat around the middle class: Any company who wants to grow need to go abroad, and beyond the neighbouring countries. For the Nordic countries, the world is now our market place. Lisbeth Greve Harbo & Lise Smed Olsen, Research Fellows from Nordregio presented a close-up on migration and tourism. Are they the growth engines for Nordic regions? There is a promising sign of continuos, growing tourism in many Nordic regions. It has had a substantial effect on GDP, primarily in Iceland. Lisbeth presented data and numbers behind the hot topic of migration.